There’s no better way to get into the holiday spirit than to round up your family and friends for a Christmas lights tour. From Christmas light displays that flash along with your car radio to special Christmas light display events for the whole family, here’s a list of the best Christmas lights in Tampa. From the comfort of your own car, you’ll be captivated by this light display that features Christmas lights synchronized to the music of the Trans-Siberian Orchestra and others! Music is broadcast to your radio on 96.3 FM, so take your time and find a spot to park and watch the lights go crazy. Music and Christmas go hand in hand, so it only makes sense to enjoy light displays accompanied by music. This is one of the larger Tampa / St Petersburg area light displays that includes trees, gifts, animals, and animated displays that dance to the music. 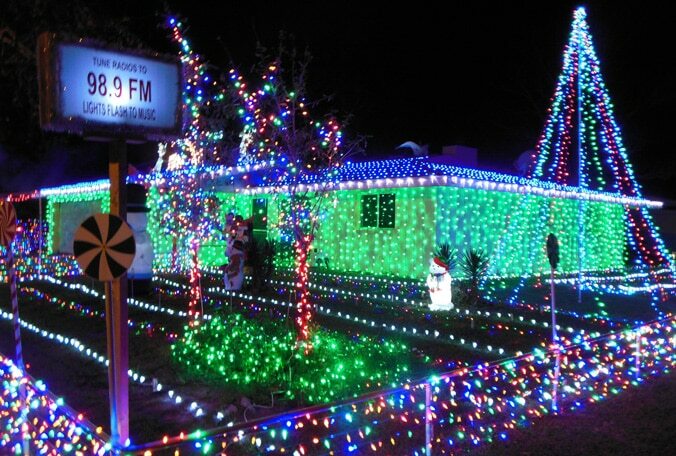 Tune into 98.9 FM, sit back, and enjoy the amazing Christmas light show. You’ll know you’ve found this places when you see the twenty-three-foot tree lit with colored lights. There are 15,000 more lights on the house itself, and they’re all synchronized to music. The 17-minute show plays continuously from 6:30 to 9:30 p.m, so stop by for a memorable show. Now through December 31st, the Shops at Wiregrass presents a brand new show that features dancing lights, holiday decorations, and even snow choreographed to music. Shows are nightly and start at 6 p.m. Click here to visit their website for more information. The owners of this house have been decorating for the holidays for over 25 years. They setup over 50,000 LED lights, a classic 10-foot tree, and other fun moving displays. Terry and Linda Melendez have been going all out for over 30 years! Come by around 6:30 to walk around and experience their bright, fun, and festive holiday spirit. They also pass out popcorn to visitors, going through 300 pounds a year! While festivities are free, Terry and Linda welcome donations! This house features one of the country’s biggest light displays. With a quarter-million lights, the Big Bayou is a house you can’t miss. Park your car and take a walk-through yard tour—which covers about a half-acre of land. Enjoy games for the kids and 18 different trains (all running through the yard at one time!). If you want more than just one crazy house, Bayshore Boulevard has four blocks of them! For more than 10 years, this neighborhood has been taking part in these spectacular light displays. The streets are lines with trees that are also lit, creating a tunnel that takes you through all the houses. On Sundays, Tuesdays, and Wednesdays in December, you can experience a 2-hour cruise up the Hillsborough River to see all the beautifully lit bridges of Downtown Tampa. Enjoy Christmas caroling, a holiday buffet, a visit from Santa, and a lot more! Cruises sell out almost every year, so be sure to book yours now on their website. Take a nice evening stroll through the Florida Botanical Gardens while they’re fabulously lit with Christmas lights. This event is the Garden’s largest fundraiser with more than 450 volunteers and sponsors. The suggested donation is only $5 for those 13 years and older. Check out the display nightly from 5:30-9:30 p.m. until December 30. Get more details here. Appliance Repair Specialists wishes you and your family a holiday season that’s merry and bright!